Double ziplock bags and plenty of packing peanuts. Went parchment paper covered with aluminum foil, myself. Yeah, I went with Ziploc bags, foil, wax paper, paper bags, and gumption. 100% class all the way. @MadEddy‌ Hooray, reinforcements have arrived! The sesame seed cookies are something I have never tried, and are delish! 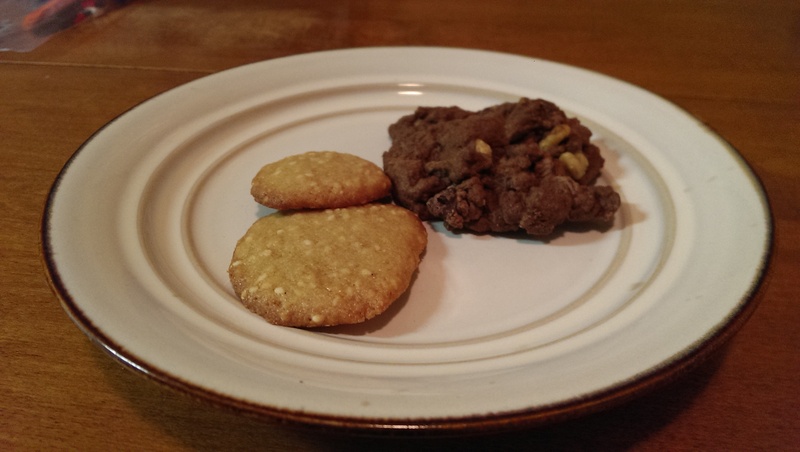 And the chocolate walnut cookies? Hot. Damn. Thank you! I am glad they arrived okay! Hey @MadEddy‌, what recipe did you use for those sesame seed cookies? I will put seeds in anything and that cookie sounds intriguing. What remains of the absolutely delicious cookies @Cello gave me yesterday when I visited. Given the number of cookies visible, how nice they look, and the fact they were given to you yesterday...I'm assuming you received a quantity best measured in KG? Probably, we ate one hell of a lot of them while playing and laughing at Heavy Rain. Heard people were showing off cookies in here. I got these delicious things from @neville. They were all crazy scrumptious. As proof, these are the last ones around after having the box in my house for roughly 20 minutes. I've made a note never to open boxes in front of guests ever again. I will also need the recipe to all of these. Oh, and neville, I am a vegan 98% of the time (although not gluten-free), so these were absolutely perfect. And I have a weird weakness for flapjacks. Granola bars, whatever. Can confirm. We ate enough that I went to bed with an upset stomach. Which when it comes to a cookie binge, is basically the ultimate victory. @Psykoma made some amazing treats too, which I'll have pictures of tomorrow!